Ladies and Gentlemen, Roll up, Roll up, for the biggest circus event of the year! Watch Monsieur Mercury defy gravity on his faithful trapeze! Louie watches as Jasper, not Monsieur Mercury to her, tries to perform his triple somersault but it all goes terribly wrong. Theres a hush and a moment where she believes her friend has passed. Then theres a sigh of relief as he opens his eyes. But the showstopper is done for and Mr Chipchase is not impressed. Despite the fact she’s been training for years and can walk the tightrope like no other he won’t give Louie a chance and forces her hand. To get her turn under the the spotlight she must follow her heart, despite it taking her a long way from the only home she has. Her journey will be fierce, she will have to two mysterious strangers, cross the Niagara Falls and look death square in the eye. Can she do it to become the Girl Who Walked on Air? This book was incredible!!! Emma Carroll does historical fiction so well and if you’re a fan of the genre but haven’t read her books yet, do it now! 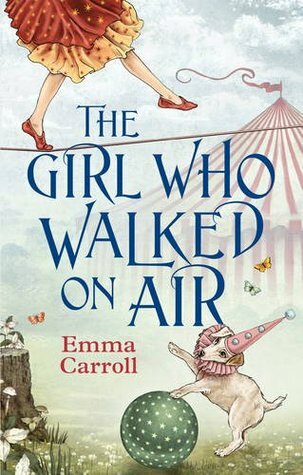 The story is fantastic and you will be hard pressed to find a Victorian YA circus story as fitting as this one. Louie is an orphan, left in the charge of Jasper at Mr Chipchase’s circus. She doesn’t know anything about her mother expect that she left her there a very long time ago. Mr Chipchase is an oddball and wont allow her to draw attention to herself so I thought right from the start that there must be a reason for that. Events draw on and she meets a young boy called Gabriel, who leads her, unwillingly, to bigger and better things. Not everything is as good as it seems though and Louie finds out more about herself, her life and who her true family is on a journey which takes her across the atlantic. Its a sad, powerful story full of deceit and bravery on Louie’s part and I absolutely adored it. Louie has to have been my favourite character because she is so strong and brave. She refuse to take any crap but her attitude does land her in trouble sometimes… like its quite easy to work out how she will react to certain things which is why certain things happen the way they do. She’s her own worst enemy in some parts of the story, but she can also be other peoples worst enemy too. I loved her and I loved Pip, her dog, he was such a cute sidekick and I was said he couldn’t join her on her trip. Gabriel was an interesting character who I couldn’t work out at the beginning but he grew on me and I think he was strong in his own way too. The collection of what could only be called misfits at Chipchase’s circus were awesome too and I loved that they felt like family throughout the book, no matter how mean some of them were at the beginning. I can’t get over how much I loved this book. It was fully of daring and without many references to the time it was set in it was obvious that was where it belonged. I can’t wait to see what Emma does next but I hope with all my heart she carries on writing historical fiction because she seriously has a talent for it!